Publisher: Ace Books, published by arrangement with Second Age, Inc.
King Arthur travels to the future and lands in New York City. New York City is to Camelot as King Arthur is to Mayor of New York. OK! Is Merlin with him? But of course! Do you think he could survive New York without a little help from a trusted adviser? The legendary King Arthur emerges from an enchanted cave and returns to reign once again in Camelot. Only it’s 1500 years later and Camelot is now known as New York, New York. Hardly a fairy tale city. “Because New Yorkers are all crazy” and they are not in the habit of calling anybody “Your highness”. So don’t think you can just show up and take over. You have to run a campaign for a public office and win the votes of the people. Running for Mayor shouldn’t be too hard. Especially since you still have Merlin as your trusted counselor. 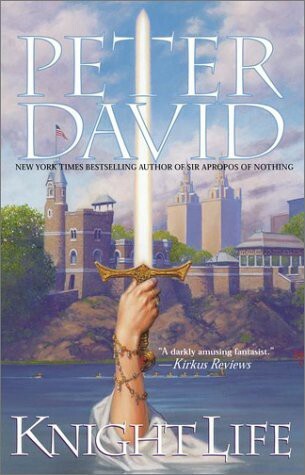 Peter David is a New York Times bestselling author that most people might associate with “The Incredible Hulk” (comic books), but Knight Life is his very first novel. After the author became popular his fans began asking for it, so he obliged them. It’s been revised and expanded. The original is out of print. The book has received excellent reviews by Booklist, Library Journal, Publisher’s Weekly, etc. Are you wondering why it hasn’t been made into movie? So is Mr. David. He wrote a screenplay, only the book has yet to make it to the screen (as of April 2014). Knight Life is part of a trilogy. 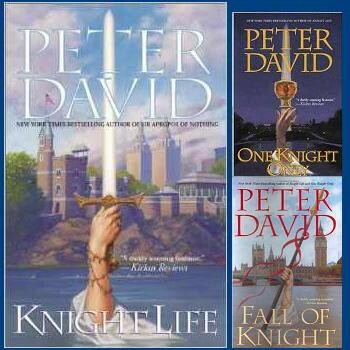 David’s follow up books are: One Knight Only and Fall of Knight. It’s an election year in the USA. The witty comedic twist probably could not have been pulled off if Arthur had resurfaced anywhere else in the world other than New York City. If you decide to read Knight Life, you’ll breeze right through the first chapter. When you get to the next chapter, the armored knight makes his first appearance in Central Park. At that point … _______. Originally published at Daily Two Cents on April 29, 2014.